The next meeting of the Society takes place on Thursday 12th January 2012 at 7:30 pm in St. Andrew’s Church, Bilston Street, Sedgley. Members and visitors are invited to come and share their memories of sporting events and personalities connected with the Black Country and further afield. Everyone is invited to bring along artefacts, photographs, posters and memorabilia or just tell stories about the world of sport. Start the New Year by sharing your memories and ‘treasures’ at this friendly gathering. Take the chance to relive local rivalries and recall names and venues – the field is wide open. In addition there will be notes on London’s three Olympic Games and an opportunity to test your knowledge of obscure local sporting links. The Victorian railway companies criss-crossed the country with over 20,000 route miles. Today one of these lines still runs through the old Sedgley Manor. We asked you to name the station. 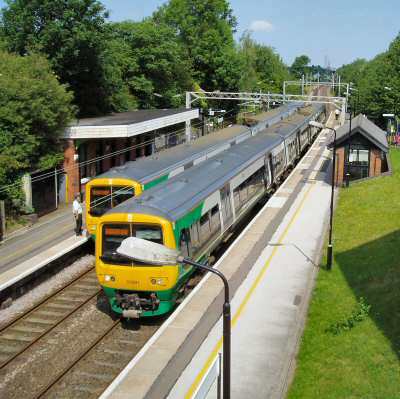 Trains have rattled through Coseley since the 1850s – originally the Stour Valley line of the London & North Western, then from January 1923 the London, Midland & Scottish, followed in January 1948 by British Railways and then in franchises to London Midland in November 2007. Along the way the station name changed from Deepfields & Coseley on opening in 1902 to Coseley [Deepfields] in the 1950s & 60s and finally Coseley in May 1968. In December 1966 the first electric train passed through the station. A quarter of a mile to the north the pre-1900 station was used for goods traffic until closure in the 1950s. Today the old goods yard is used by a scrap metal merchant.